I recently went to Ireland and Northern Ireland. The countryside was very beautiful with wonderful landscapes and pretty towns. I read in the guidebooks that the Antrim Coast of Northern Ireland was the most beautiful of all of Ireland. It was indeed breathtaking. Northern Ireland is very rural with lots of sheep and cattle farms. I took this photo near Dunluce Castle. The scene looks so peaceful and serene to me. These are photos of Dunluce Castle. The castle was built in the 1500's but now has fallen into ruin. It was a great place to explore. 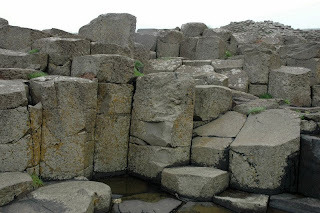 It was situated on a cliff, along the Antrim coast. At one time some of the castle fell into the sea. Sadly, some servants working in the castle kitchen at the time were swept out to sea. We also went to see Giant's Causeway. It has these strange geometric rock formations. It was almost hard to believe they were real. You could walk on the rock formations like they were steps. The surrounding area was very beautiful. Northern Ireland was great to photograph. Some many beautiful landscapes and the coast was wonderful. I have more photos of Northern Ireland and Ireland posted on my blog. Kerry - beautiful pictures! 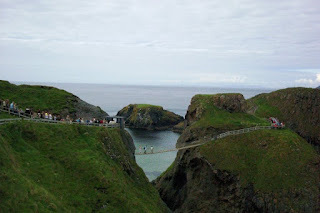 I have always wanted to visit Ireland and loved this post!